The government said yesterday that the Committee on Public Enterprise ( COPE) was answerable to Parliament and no one else could give it directives. 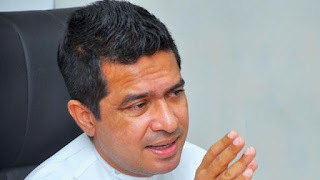 State Minister of International Trade Sujeeva Senasinghe, addressing the weekly Cabinet Press Briefing at the Parliamentary Complex, said that some were trying to find people guilty through a "trial by media", but the COPE report on the profits made by Perpetual Treasuries through the purchase of bonds during the last financial year, had not been finalised. It would be submitted to Parliament shortly, he noted adding that the correct picture would be revealed then. Senasinghe said that there could be only one official COPE report. "No member can issue his own versions. There can be differences of opinion, but all that has to go into the official report.Some are trying to find people guilty through a trial by media, but that is not correct. I appeal to the media not to release bits and pieces since that would not be fair by the company against which the allegations had been levelled."